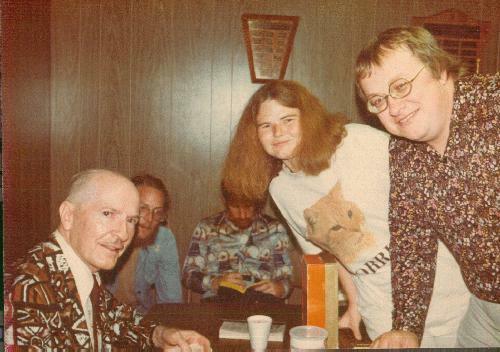 Robert Heinlein, Beverly Warren and Bill Warren at LASFS in 1976. Photo from Fanac.org. Critic, film historian and long-time LASFS member Bill Warren died October 7. Over the past decade he’d suffered from a series of cardiac and pulmonary health problems, and lately was treated for an infection but never recovered. Forry Ackerman invited us to a birthday party for Dr. Donald A. Reed, president of the Count Dracula Society. We’d heard of the Society, but had as yet had no contact with it, and were a little uncertain about it. Somehow, the idea of dressing up in tuxes to attend dinners given by a group named after a vampire seemed a little more bizarre than our countrybumpkin Oregon minds could deal with right away. But Forry told us there would be interesting people at the party. Upon arriving at the event, held in the screening room at the back of Milt Larsen’s home, the first two people we saw were Robert Bloch and Christopher Lee, neither of whom we had met until that time. Both were charming and affable, with Bloch being especially warm. A cake with a bat on it was presented to Don, and then we all sat down to watch WereWolf of London, the first time we’d seen it on a screen. We joined the Dracula Society on the spot. 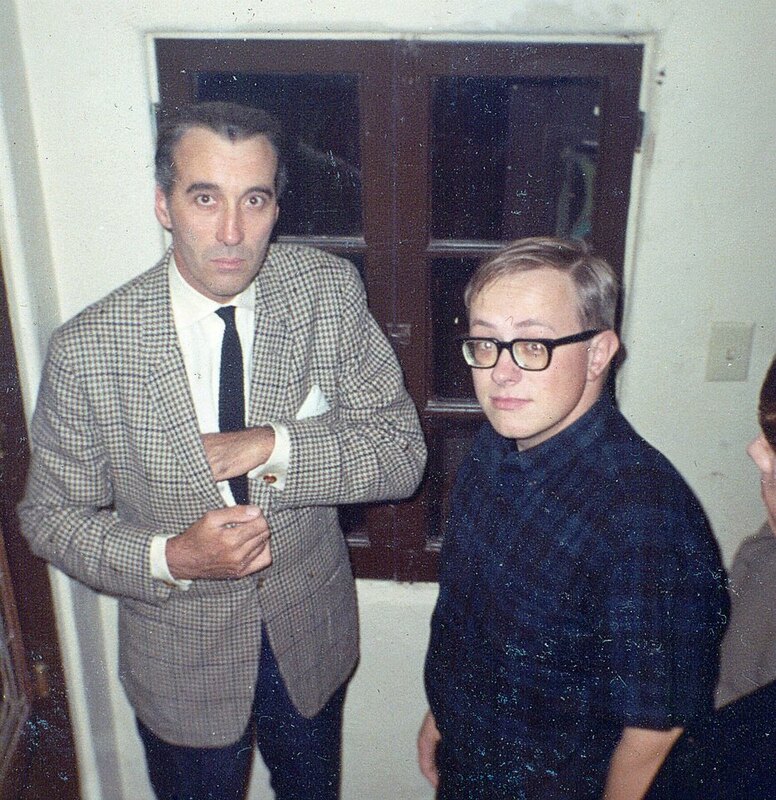 Christopher Lee and Bill Warren in late 1960s, in home theater of Milt Larsen. 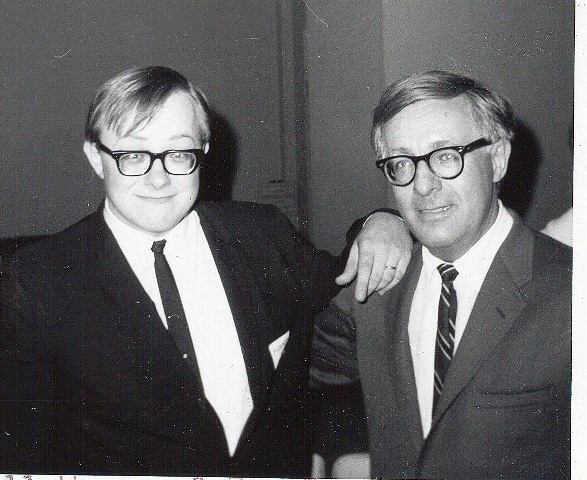 This was also the period when Bill met Ray Bradbury for the first time, at a big surprise party for Forry in 1967. The photo below was taken five minutes after they met, after they had swapped glasses and discovered their prescriptions were similar. Bill Warren meets Ray Bradbury. Ackerman, a founding LASFS member, probably brought Bill and Beverly into that club, too: they joined in December 1966. Bill became one of its hardest-working members, honored with the Evans-Freehafer Award in 1973, and he served for many years on the Board of Directors. His suggestion led to making a one-shot winter convention into the club’s annual LosCon. During this period, he also wrote scripts for (Jim) Warren Publishing’s black-and-white comic books Creepy, Eerie, and Vampirella. Later he was a contributing editor to Leonard Maltin’s annual Movie Guide for more than twenty years. 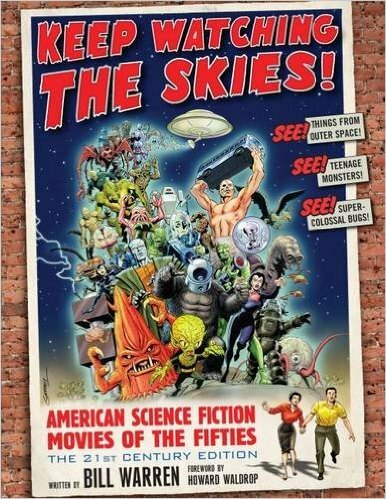 He produced annual movie reports for many Nebula anthologies. Subsequently he wrote film history books, The Evil Dead Companion, about Sam Raimi’s horror series, Set Visits, interviews with filmmakers on the sets of their films, and Keep Watching the Skies, about science fiction movies of the 1950s. He also co-authored a fannish mystery with his friend Allan Rothstein, Fandom Is A Way of Death, published and sold during the 1984 Worldcon. The solution to the mystery was placed in a separate envelope at the back of each copy, because only on the last day of the con was the murderer was revealed — and took a bow. I met Bill and Beverly at the very first LASFS event I ever attended, the 1970 LASFS Anniversary Dinner. When I co-chaired the 1978 Westercon with Ed Finkelstein, Bill ran the film program. And I remember that right after the con was over, before the rented prints had to be returned, Bill gathered the committee at the LASFS clubhouse to watch a couple of the rarely-seen feature films he’d chosen. The 13 of us who’d run the con were exhausted – which caught the eye of fanartist Linda Miller, who did a drawing of us symbolically clumped together for mutual support, a triangular composition with the tallest, Bill Welden, in the center, and the rest distributed around him by height…. Bill participated in the early days of social media. In 1989, he created the ShowBiz Roundtable for the online service GEnie to generate discussions about films and other aspects of show business. When his friends produced movies, there was often a minor role or appearance as an extra for him –Joe Dante, Don Glut, and Somtow Sucharitkul were among the people who cast Bill in The Howling (1981), The Laughing Dead (1989), Hollywood Boulevard II (1990), My Lovely Monster (1991), Ill Met By Moonlight (1994), Dinosaur Valley Girls (1996), and The Naked Monster (2005). During the 1990s, he and Bill Rotsler produced segments surveying American television for the French TV series Destination. In fact, the day before Rotsler died in 1997, he and Bill had driven all over Hollywood shooting video of billboards for an installment of the show. And after Rotsler died, Bill became the custodian of his good friend’s unpublished fan art, of which there was an enormous amount. He did his utmost to get it into the hands of fanzine editors for publication. Bill also discovered the raw material for 15 more issues of Rotsler’s fanzine Masque, which he completed and distributed to the mailing list. I found that my taste as a kid was pretty reliable, even if more enthusiastic than myself as an adult. I no longer think that It Came from Beneath the Sea and Creature with the Atom Brain are the two best movies ever made, though I still like both of them. And those I didn’t like then, I still don’t like. Illustration by Sue Mason. Published in File 770 #139 and elsewhere. 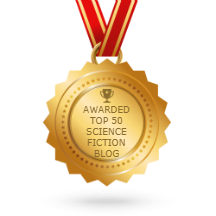 Sue Mason from the United Kingdom has won the 2014 Rotsler Award, given for long-time artistic achievement in amateur publications of the science fiction community. Established in 1998, the award carries an honorarium of US$300. Mason is a widely-published pen-and-ink artist who is particularly well-known for her activity in the British fanzine Plokta. Her illustrations are whimsical, humorous and richly-detailed. 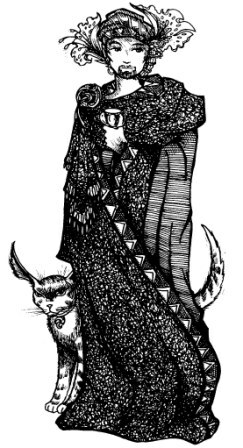 Some of her best artwork can be seen in the chapbook I Want to Be a Celtic Death Goddess When I Grow Up [PDF file]. She is also accomplished at pyrography, the process of producing designs by burning them onto a surface, generally wood, leather or paper. Mason is a two-time winner of the Best Fan Artist Hugo. She has won the Nova Award for Best Fan Artist seven times. The Rotsler Award is sponsored by the Southern California Institute for Fan Interests, a non-profit corporation, hosts of the 2006 Worldcon. 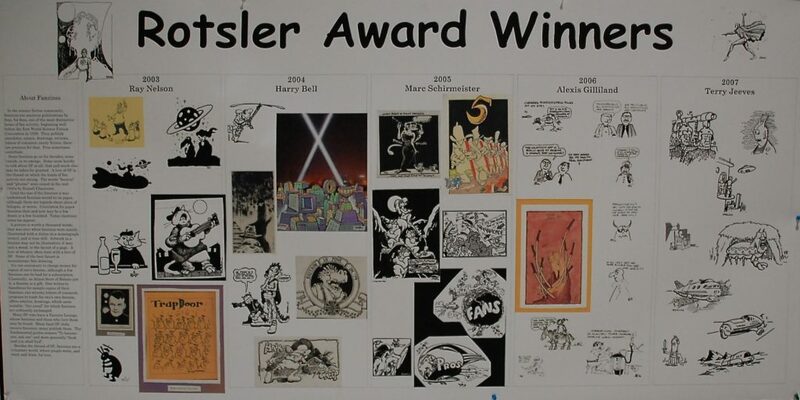 The award is named for the late Bill Rotsler, the talented and prolific fanartist. Claire Brialey, Mike Glyer, and John Hertz served as this year’s judges. The award was formally announced on Saturday, November 29, 2014 at Loscon 41. An exhibit honoring Mason’s work was displayed in the Art Show. For more about the Rotsler Award, visit www.scifiinc.org/rotsler/. Samples of Mason’s work will be posted shortly. Bill Rotsler and Paul Turner at Westercon XIX in 1966. Photo by Len Moffatt. By John Hertz: Bjo Trimble has been inspiring us all for a while. The way to write her name, incidentally, sometimes doesn’t get through the dark glass of software. A circumflex “^” goes over the “j”, being an Esperantism to show one says “Bee-joe”. She knows so much and can do so much, and has, that she’s hard to describe briefly. You can look up her early days, and her husband John Trimble’s, in Harry Warner’s book A Wealth of Fable. She won’t take credit for inventing s-f con Art Shows, but she earned it. She did a lot for Star Trek, the Society for Creative Anachronism, her and my local club the Los Angeles Science Fantasy Society, Flesh Gordon (yes, I meant to spell it that way), and fanzines, being herself a leading fanartist, and a fine fanwriter as you’ll see in a moment. The earliest recipient of the Big Heart Award alive, she’s been dyeing for years. She was Fan Guest of Honor at the 6th NASFiC; she and John were conjoint Fan Guests of Honor at the 60th Worldcon. At the 17th Worldcon she moderated the most remarkable panel discussion in Worldcon history, which started Sunday night, still had sixty people at two in the morning, and ran till 4:30 a.m. We’ll have a NASFiC in the same town this summer. You may have heard of the Harlan Ellison – Bill Rotsler Egg Adventure at Westercon XIX in 1966. I mentioned it myself in File 770 136. She set the record straight with a letter of comment in De Profundis 493. In the interests of art as well as science, we thought we’d answer this one question: How do you draw a smiley-face on a fried egg? Since we were at that breakfast, mainly because it’s always entertaining to share a meal with Harlan, we can verify this. First, you have to get said fried egg to a totally solid state. That’s why Harlan didn’t want to eat it. Rotsler always carried felt-nib pens for quick-draw. While Harlan was raising a fuss with a waiter who obviously didn’t give a damn who Harlan was, or why he was yelling about an egg, Rotsler pulled the plate with the offending egg to himself and quickly drew the face. Then Bill silently slid the egg back in front of Harlan. When others at the table saw the egg, there was general hilarity, which of course enraged Harlan even more. The waiter looked down at the enhanced egg, did not smile, and walked away, causing another explosion from Harlan. Then he saw the egg, glared at Rotsler who looked back as if he had no idea about all this, and Harlan decided it was funny. John and I were running that Westercon Art Show, so we should not have been surprised when Rotsler walked in with the egg still on its plate, and registered it as an entry in the Art Show. It was displayed, with a bid sheet. Then some upper-level hotel staff member saw it and demanded that it be removed. We showed him the art paperwork that made it a legit art object, and he stalked off. Another, higher-level hotel person showed up to demand that the egg be removed “for health reasons”. John pointed out that the egg was so ossified that it had passed beyond food into fossil, and qualified for exhibition. The Art Show was ignored by the hotel after that, except by the hotel housekeeper in charge of that room, who wanted to know if she should dust the egg or not. The egg sold to someone, but I believe we had to find a paper plate for it as the hotel threatened to charge the convention an outrageous sum for their “valuable” plate. They didn’t want to break up the set. Scott Shaw!’s costume for the 1972 Worldcon – The Turd — was made with 3 jars of peanut butter, a pair of Leggs pantyhose, cornstarch and some cornhusks. It brought him lasting infamy and inspired one of Rotsler’s Rules for Masquerades. And after decades of sharing the story with convention audiences Shaw has now told it to the camera. I was one of the first fans to see Shaw in costume that day and many times considered sharing my eyewitness account here. But there’s really no second line to a story that begins, “I was there when The Turd came out.” Put another way, I was standing in front of the elevator doors when Shaw arrived and stalked off to the ballroom, leaving chunky drips in his wake. Comics artist Scott Shaw! was 21 and his story about a monster from the underground sewers called The Turd had been published not long before he arrived at the Los Angeles Worldcon of 1972. He’d been to a Worldcon masquerade before. This time he felt an overwhelming desire to see what people who worked all year on their costumes would think about an entry someone had made in the last five minutes. 7. Parts of your costume should not be edible or smell. Parts of your costume should not fall off accidentally, brush off against other contestants, or be left lying around on the stage. Afterwards Shaw took an epic shower. He worried about what the maid would think, but that’s nothing next to other embellishments that end his story. As Shaw tells it, a few weeks after L.A.Con the hotel plumbing exploded, having been clogged with massive amounts of peanut butter. The hotel came back to the convention committee and charged them thousands of dollars for the repairs. That last part never happened. For one thing, the con only cleared a couple of thousand dollars altogether and they didn’t spend any of it replumbing the International Hotel. The peanut butter reportedly did clog the bathtub in Shaw’s room, but that’s all. Still, you have to appreciate the symmetry that Shaw ends his story with a bunch of BS. 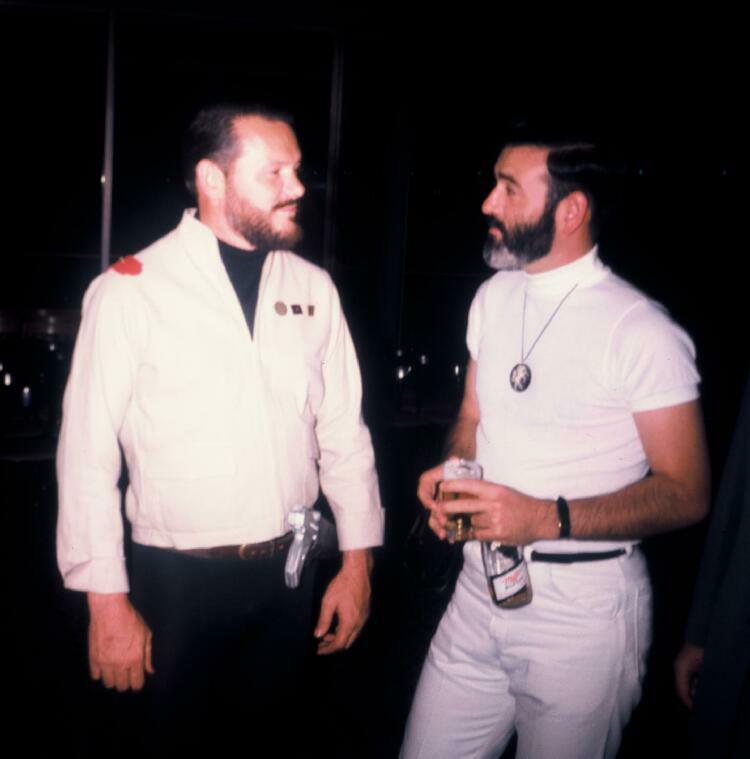 Posted in 70s Fanhistory, Skiffy, Worldcon	| Tagged Bill Rotsler, L.A.con, masquerade, Scott Shaw! By John Hertz: C. Ross Chamberlain of Las Vegas has won the 2012 Rotsler Award, given for long-time artistic achievement in amateur publications of the science fiction community. Established in 1998, the award carries an honorarium of US$300. Chamberlain is an adept humorist known for graceful line and eye-catching composition. As a good artist he makes use of available technology. In the days of mimeography he was masterly with stylus and shading plate. Now he works marvels with Photoshop. The Rotsler Award is sponsored by the Southern California Institute for Fan Interests, a non-profit corporation, which in 2006 hosted the 63rd World Science Fiction Convention. The award is named for the late Bill Rotsler, a talented and prolific artist over many years. Claire Brialey, Mike Glyer, and John Hertz are the current judges. The award was announced on Saturday, November 24, 2012, at Loscon, the annual Los Angeles SF convention. This year’s convention was Loscon 39. For more about the Rotsler Award, visit www.scifiinc.org/rotsler/. That internet archeologist Bill Burns has discovered it’s still possible to view Michael Bernstein’s old Rotsler.com dedication site on Archive.org, with images. A lot of people want to know how they can win a Hugo Award. I don’t think any of them are looking to win one posthumously, which is just as well, because it would be a terrible strategy. In fact, you could say that Hugo Seeker Tip Number One is: Don’t die. Here’s how strong the bias is in favor of the living. Bill Rotsler died in October 1997 after winning two consecutive Best Fan Artist Hugos. 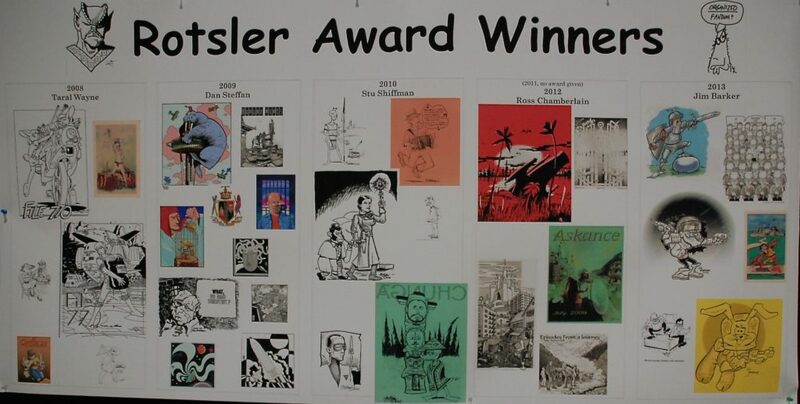 Fanzines printed dozens and dozens of previously unpublished Rotsler cartoons in the year of his death, yet he was not even a Hugo nominee in 1998. Voters want to see happy winners appearing on stage at the Hugo Ceremony. The voters’ preference for live winners has been reinforced by bad experiences with the other kind. Lester del Rey, in a letter read by a spokesman, declined the Best Professional Editor Hugo voted posthumously to Judy-Lynn del Rey in 1986, saying that she would have objected to the award being given to her just because she had recently died. Frank Wu has preemptively announced that he will decline if nominated for Best Fan Artist in 2008. “This essay is incredibly hard to write. I don’t want to be misunderstood, to come across as churlish, arrogant, calculating or ungrateful…. 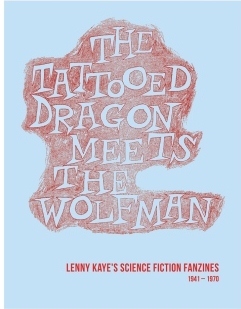 Having won three Hugo Awards for Best Fan Artist, in three of the last four years, I have decided that – should I be nominated – I will decline the nomination [in 2008],” wrote Frank in an editorial published in Abyss and Apex issue 24, dated the fourth quarter or 2007. I learned about Frank’s decision when his editorial popped up in response to a Google search about another fan artist. Such news must have been reported and discussed long since (though not anywhere Google could show me). Such a remarkable example of selflessness is worth retelling, in any case. To help show that withdrawing is not an ungrateful response to his popularity, Frank lists many other people who withdrew from past Hugo races. He might have added the two most important examples from the Best Fan Artist category itself. There’s not another category where serial winners have been so conscientious about sharing the limelight. Phil Foglio won the Best Fan Artist Hugo in 1977 and 1978. 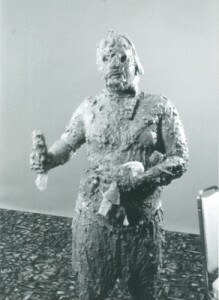 During his last acceptance speech, Foglio withdrew from future fanartist Hugo consideration saying, “I know how hard it is to get on the list, and once you do it’s even harder to get off.” Victoria Poyser won the category in 1981 and 1982, then announced she would not accept future nominations. Foglio and Poyser both went on to professional success. Frank does tell how Teddy Harvia and Brad Foster declined their nominations in 1997. He speculates, “Apparently they were trying to clear the path for fellow nominee Bill Rotsler, who would pick up his Hugo and then pass away a month later.” Well, no. 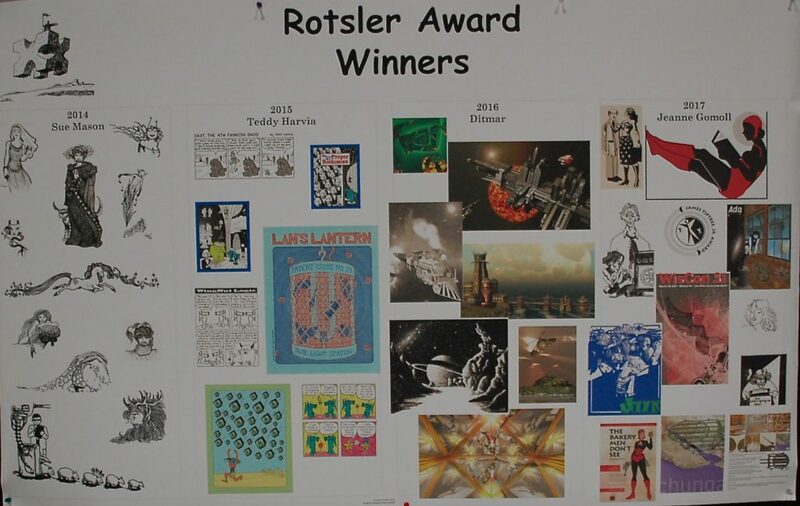 Just the previous year (1996) Rotsler had won the Best Fan Artist Hugo, a Retro Hugo, and a Special Committee Award. He’d already cleared his own path. The reason Harvia and Foster gave in 1997 is that they had a self-perceived conflict of interest created by their close involvement with the San Antonio Worldcon. Foster had drawn the covers for all the Progress Reports, and Harvia contributed other art. They made a highly-principled decision. A past progress report artist had been criticized for having an unfair advantage over competitors for the Hugo — that’s fandom for you, where someone demands that our top talents forego Hugo nominations as a condition of being allowed to provide art for free!